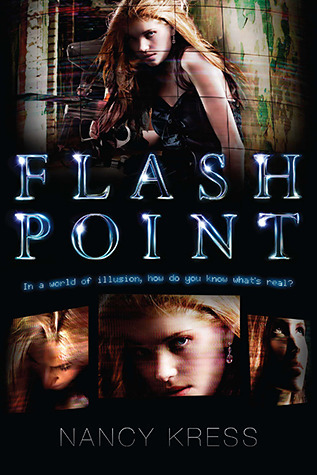 Posted on September 16, 2013 by Miranda C.
Flash Point is a dystopian fiction set in a future United States after an economic collapse has left many people jobless and rioting. Amy Kent, a teenager supporting her sister and dying grandmother, signs up for a job on the reality TV show Who Knows People, Baby – You?, where viewers try to predict the reactions of six players to surprise crisis scenarios. Desperate for ratings, the television producers put the contestants in increasingly real danger. Though the premise of this book is similar to The Hunger Games, it focuses more on the turbulent, poverty-stricken society it is set in, rather than survival. I enjoyed that the teenage players are chosen to fit stereotypes – the spoiled rich socialite, the nerdy strategist, the relatable everygirl – but by the end of the book, when they have decided to team up against the television executives, each one is revealed to be more than they seem. Though the characters’ goal is to expose the motives of one program rather than changing the world, they learn that no one can really predict the actions of others. I would recommend this book to anyone 14+ years old (mostly for language), who enjoys dystopian fiction and interesting plot twists. This entry was posted in Book Reviews and tagged book review, dystopian, nancy kress by Miranda C.. Bookmark the permalink.